A couple of discoveries have revealed early Mac support for the high end ATI and NVIDIA graphics cards, raising hopes that Apple will soon be updating their desktop computers. Both the Mac Pro and iMacs are overdue for product refreshes with no solid timeframe for either update. The newly released Mac mini has revealed a new set of ATI drivers buried within its default Mac OS X installation. New Macs always have a slightly newer version of the system software installed that provides support for the new hardware. In this case, the software also revealed early support for the ATI Radeon 5 series. 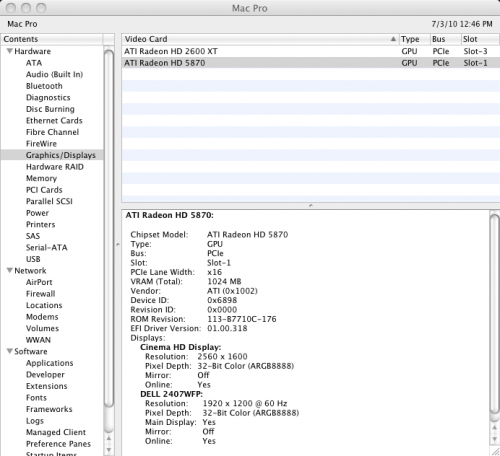 Some tinkerers have been able to use the software to drive an ATI Radeon 5870 on an actual Mac Pro. Meanwhile, a recent NVIDIA Driver release have shown references to NVIDIA GeForce GTX 400 series support. For the masses, neither release is particularly useful, but does remind us that Apple's desktop line is overdue for update. There has been talk of Mac Pro updates for months, but no clear timeframe when it might happen.